A strong wind of optimism is stirring among American investors in France in terms of future, image and employment. . . The consulting firm Bain & Company and AmCham France published the 18th edition of the AmCham-Bain Barometer, which measures, year upon year, the perception of France by American investors as well as the attractiveness of life in France for American employees. This study is based on responses from 156 US companies located in France representing more than 70,000 employees and more than 53 billion euros in revenue across all business segments. • While the factors contributing to France's attractiveness are strengthening, we nevertheless observe the persistence, year after year, of factors that have a negative impact on the attractiveness of our country. 1. 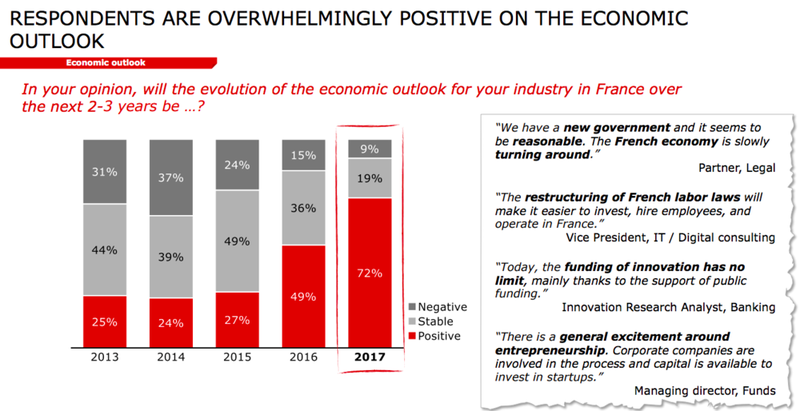 More than 3/4 of US investors have a very optimistic view of the economic future of France, believing that the evolution of the economic context in our country will have a positive impact on their sector of activity in the years to come . 2. More than one out of two American investors plans to recruit new employees in France in the next 2-3 years (whereas this score was only 21% in 2016). 3. For 9 respondents out of 10, the action of President Emmanuel Macron facilitates investment and improves the image of France in the United States. 5. 80% of respondents consider that the tax system in place limits the attractiveness of our country. And, of great interest to our "lifestyle" housing market - we see outlined a dramatic increase in the quality of life and attractiveness for individuals with an 86% increase in the Net Promoter Score (NPS). Life is looking a lot sunnier in France vs 2014. Merci, Mr Macron !! In general, we know the attractive qualities that lure us to France and we put up with the detractors - because, well... "c'est la vie". Read the full AmCham Bain Barometer here.